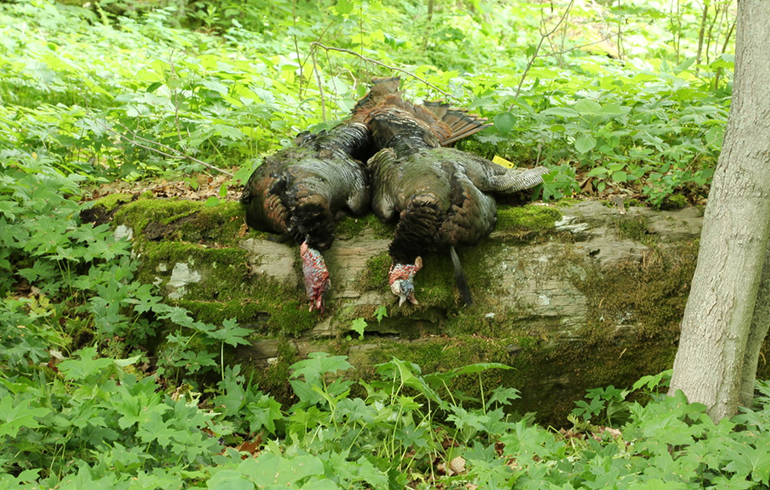 Turkey season is just around the corner and has even begun in some states. As I gear up for the first turkey hunt of the season, I like to look back on past seasons and reflect on the things that I have learned through personal experience and through hunting with others. 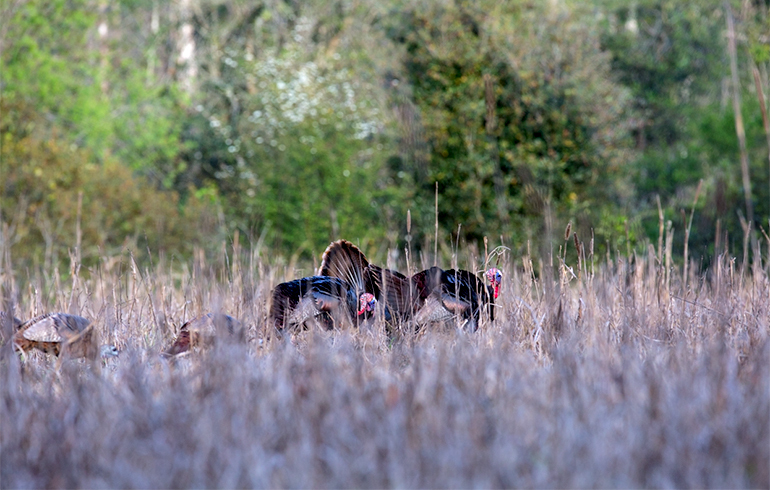 Preseason scouting is essential to turkey hunting success. Since turkey leave many clues as to where they hang out, they are not overly difficult to locate. Start off by looking for roosting trees, then walk through the woods and look for tracks and upturned leaves from scratching. If you have dirt roads in your hunting area, look for dusting areas and strut zones. 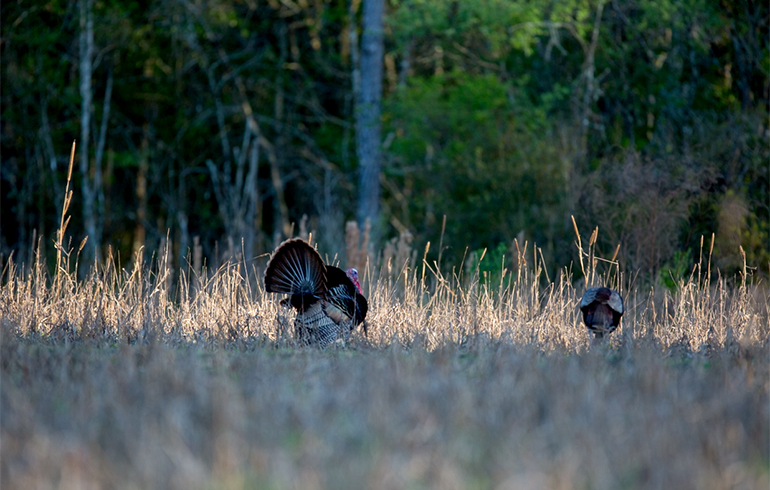 Next you will want to get out before sunrise to listen for gobblers waking up on the roost. Try to listen from places that also have good vantage points, seeing birds strutting and how they enter a field will really get your blood pumping! Seeing and hearing gobblers on the roost can lead to a higher success rate. Once you know where turkey roost, you can then sneak in before daybreak and get as close to the roost as possible without spooking the birds. Try to setup where the birds are most likely to fly down and then in the route they normally move from the roost. Hunters sometimes talk about how “call shy:” toms (and hens) can be. When I first began hunting turkeys I believed this to be true. I would go by the rule that you should only call every 20-30 minutes. Let me tell you, this led to a lot of long, boring hunts where I would be lucky to even see a turkey. As I spent more time studying turkey in the wild, I learned that they are always talking. Hunting with more experienced hunters taught me that you can call as much as you want. You just need to know how to call, and how to listen to know if a bird was actually going to come in. Turkey are just being turkey; they spook easily and will stay quite if they hear bad calling, spot movement, or if there is a lot of human activity in a hunting area. Don’t be afraid to get up and move to a new location if you are not hearing any birds. In my early days I would sit in one location all morning even when I didn’t hear a thing. Now, if I don’t hear a gobbler after a while in one location I will move to a different location. While walking to a new location, I will stop often to call. If I don’t get a response after calling a few times I will then continue walking until I hear a gobble or until I reach a new desirable location. These tactics have helped me greatly in past seasons and I look forward to learning new tactics this season. If you have any great turkey tips that you have had success with, please share them with me below! Nikki Boxler grew up on a large dairy farm in Western New York and continues to reside there today. This setting has shaped her love of the outdoors and is how she developed a passion which drives her to spend as much time hunting and fishing as possible. For her, hunting is not about the kill, it is about the experience, the memories, the moments and having fun. Her most memorable adventures take place not only in the woods but also around the grill. Nikki thoroughly enjoys her role as co-host of Winchester Life.